Tile puzzles and tile games have been with us for centuries, but I daresay they’ve never been as prominent in our game/puzzle culture as they are these days. Let’s start with the basics: dominoes. 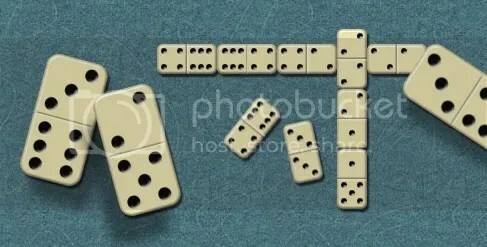 Chinese Dominoes, which are slightly longer than the regular ones pictured above (not to mention black with white pips), can be traced back to writings of the Song Dynasty, nearly a thousand years ago. Dominoes as we know them first appeared in Italy during the 1800s, and some historians theorize they were brought to Europe from China by traveling missionaries. The most common form of playing dominoes — building long trains or layouts and trying to empty your hand of tiles before your opponent does — also forms the core gameplay of other tile-based games, like the colorful Qwirkle, a game that combines dominoes and Uno by encouraging you to create runs of the same shape or color. 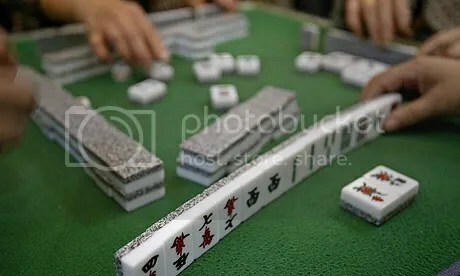 Mahjong has been around for centuries, but there are several different origin stories for the game, one tracing back to the Ming Dynasty (1368-1644), another to the days of Confucius (500 BC). The gameplay itself is about matching tiles (called melds) to build winning hands. Rummikub, another tile game (but with numbers instead of characters on the tiles) also resembles card games in its gameplay, and anyone who has played Texas Rummy or Go Fish will instantly recognize the gameplay of building runs (1, 2, 3, 4 of the same color, for instance) and sets (three 1s of different colors, for instance). All of these games employ pattern matching and chain thinking skills that are right in the puzzler’s wheelhouse, but some more modern tile games and puzzles challenge solvers in different ways. 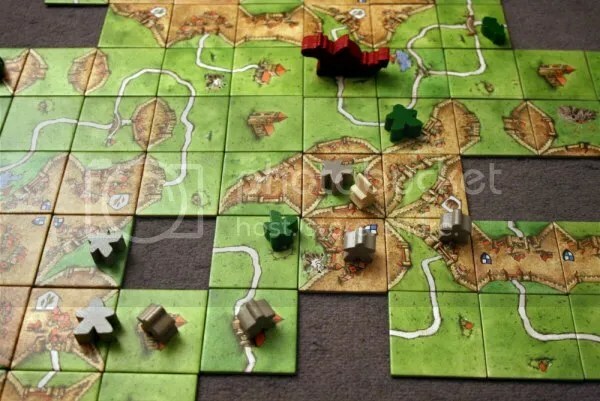 The game Carcassonne is a world-building game wherein players add tiles to an ever-growing landscape, connecting roads and cities while placing followers on the map in order to gain points. Here, the tiles form just one part of a grander strategic puzzle, one encouraging deeper plotting and planning than some other tile games. The Settlers of Catan also involves tile placement, but as more of a game starter, not as an integral part of the gameplay. Both Fluxx: The Board Game and The Stars Are Right employ tile shifting as a terrific puzzly wrinkle to their gameplay. Our friends at Penny/Dell Puzzles have a puzzle combining crosswords and tiles, Brick by Brick, which encourages the solver to place the “bricks” on the grid and fill in the answers. 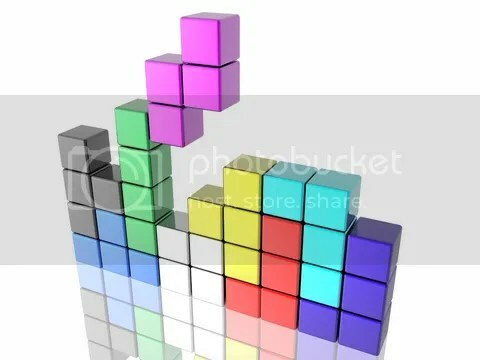 And, of course, I’d be remiss if I didn’t mention the most popular electronic tile game in modern memory, Tetris. Tetris — which turns 30 this year! — requires quick thinking, good spatial recognition, and an ability to plan ahead (especially for those elusive four-block pieces that can eliminate four rows at once!). There are plenty of puzzles that employ similar tiles — Blokus, tangrams, and pentominoes come to mind — but none that have engendered the loyalty of Tetris. Last but not least, there are the sliding-tile puzzles. These puzzles take all the challenge of tile placement games like Dominoes and add a further complication: the tiles are locked into a frame, so you can only move one tile at a time. 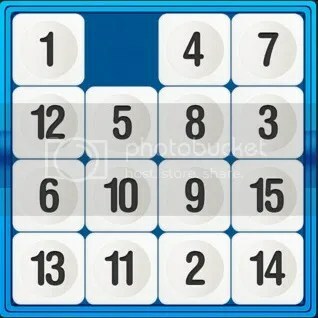 Frequently called the Fifteen Puzzle because the goal is to shift all 15 numbered tiles until they read out in ascending order, sliding-tile puzzles are chain solving at its best. Whether you’re building a pattern or forming a picture (or even helping a car escape a traffic jam, as in ThinkFun’s Rush Hour sliding-tile game), you’re participating in a long history of tile-based puzzling that has spanned the centuries. Heck, even the Rubik’s Cube is really a sliding-tile game played along six sides at once!